Two spreadsheet files list all the publications of The Mathematical Association. 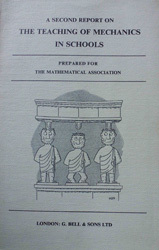 For nineteenth-century publications the MA was the Association for the Improvement of Geometrical Teaching (AIGT). The list AIGT PUBLICATIONS includes some titles only available by prior arrangement for visiting the MA Archives at MA HQ in Leicester. The publications listed in MA PUBLICATIONS can be found in the MA Library at the University of Leicester's David Wilson Library, which also holds the majority of AIGT publications (above).